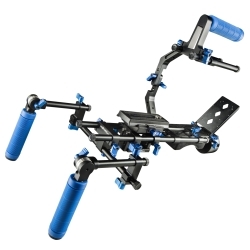 Set comprising a walimex pro hand-shoulder rig, Director III, incl. GW, LCD monitor, Director I, follow focus twin stop, magic arm 28 and angle clamp. The DSLR Rig by walimex pro stabilizes your DSLR or system camera and that way makes calm and shake-free filming possible. That way, professional filming results are possible with your camera. The Rig can be adjusted exactly to your requirements. 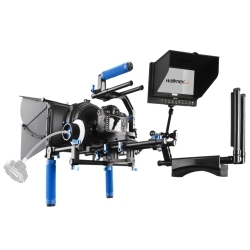 For example, you can mount a follow focus system or barn doors on the rig and that way optimize the rig precisely for yourself and your work. 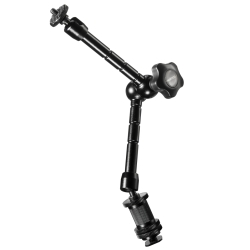 Due to the Z-bracket, you have various options of assembling the rig and that way have the option of mounting the camera on the right or left of the shoulder rest. The camera plate can be adjusted in height and length and therefore be adjusted perfectly to the position and the center of balance of the camera-lens combination. 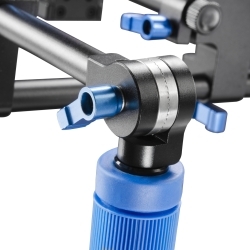 With the 1/4 and 3/8 inch threads on the bottom of the rig, it can also be mounted on a tripod. Due to the quick-release fasteners, the rig is quickly assembled and disassembled. It can be stored in a space-saving manner. Due to the grip on the C-bracket, filming on ground level or from a worm’s eye view is possible. 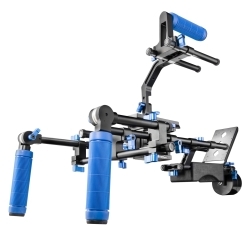 The anti-slip rubber coating of the hand grip ensures a good grip and high ease of use even during longer filming sessions. The Rig can be flexibly adjusted to your height. 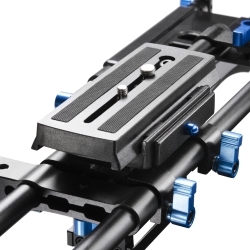 In order to do this, simply adjust the distance between shoulder rest and camera plate with quick-release fasteners. The shoulder rest is padded and lies comfortably on your shoulder. That way, longer shootings are no problem with the DSLR Rig. For a secure grip, the grips of the rig are rubberized. 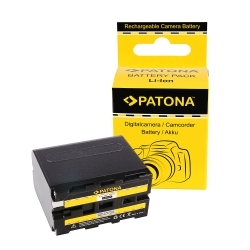 The camera plate too is rubberized which prevents the camera from moving unintentionally. 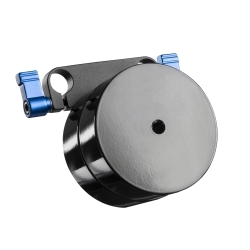 The used material, black anodized aluminum, ensures a very low weight and a high stability of the rig. Its workmanship is very high quality and it is very sturdy. 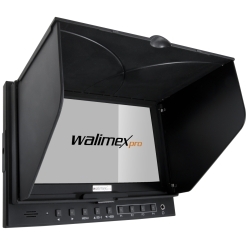 The LCD Monitor by walimex pro facilitates picture control when filming with your DSLR or video camera and therefore makes professional results possible. A sun shade, the high brightness and high contrast ensure an excellent view of the display even in direct sunlight. At a display size of 17.8cm (7 inch) and a resolution of max. 1024x600 pixels the monitor shows a clear and detailed picture. It supports the Full HD signal. The large viewing angle also allows several people a view of the monitor. 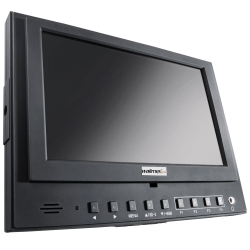 The monitor is equipped with several functions that make it ideal for professional photography and filming. With the peaking function all sharp edges are marked in red, which facilitates the control of sharpness. The 1:1 pixel mapping function allows a switching of the monitor resolution to the resolution of the camera which makes the picture true to the camera picture. The False Color function serves the control of exposure. Differently bright picture areas are shown in different colors, which allows you to quickly recognize under- and over-exposed areas. The Exposure function marks over-exposed picture areas and therefore also serves the exposure control. The 5D II mode allows a switching to the output resolution in the recording mode of EOS cameras which prevents a disruption when starting a video recording. The Check Field function reduces the display to monochromatic or red, green or blue channel. Freeze Input allows a close inspection of the frozen image. Aspect Ratio allows you to switch between the aspect ratios 19:9, 4:3 and full screen. Additionally, the functions Center Marker, Underscan, H/V Delay, Color Bar, Screen Marker, Zoom (4x), Exposure and Histogram are available to you. The device is equipped with four function buttons, which you can define freely according to your requirements. 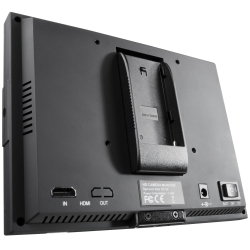 The matching rechargeable battery for powering the monitor is included. You can start your work right away and are independent of an external power supply. This makes a use on location possible and you are more mobile and flexible in your work. 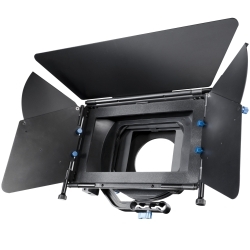 With the Matte Box by walimex pro you can shield your camera from sunlight during shootings, and therefore prevent lens reflections (lens flares). This ensures professional film results. The degree of shielding can be freely selected, by adjusting the three movable barn doors individually. That way it is also possible to use them in combination with wide angle lenses. A swing-away mechanism allows quick lens changes. 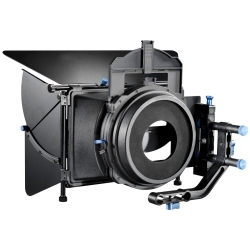 For this, you can simply fold the front part of the matte box to the side. Two filter trays with removable filter holders allow the use of 4x4 or 4x5.6 filters. Both filter trays are rotatable by 360 degrees. The filter holders can be locked into position. Additionally you receive two filter frames with inner dimensions of 9.6x9.6cm. The lens hood is compatible with all DSLR rigs with 15mm rods at a distance of 6cm. It is mounted on the rods of the rig and locked into place. 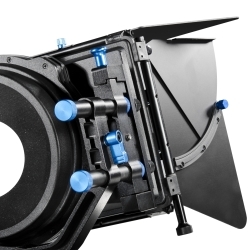 In order to adjust the Matte Box optimally to the used camera and lens, it can be adjusted in height. 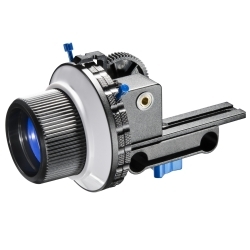 The Follow Focus by walimex pro allows you to focus smoothly when filming. With the Follow Focus you can precisely adjust the focus level. 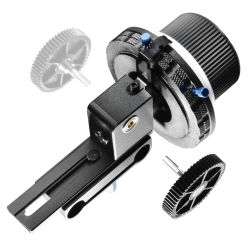 An adjustable gear ring makes the use with lenses of a diameter from 52mm to 86mm possible. Two stoppers allow you to fix the focus sequence. 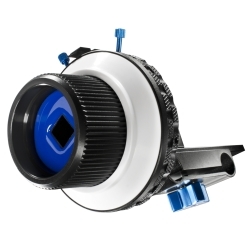 With them you can select a start and stop point, between which you can turn the focus wheel. The Follow Focus can be mounted on either side of the lens. The gear can simply be moved to the other side of the Follow Focus, making it suitable for use on both sides of the lens. This makes it perfect for both right- and left-handed use.